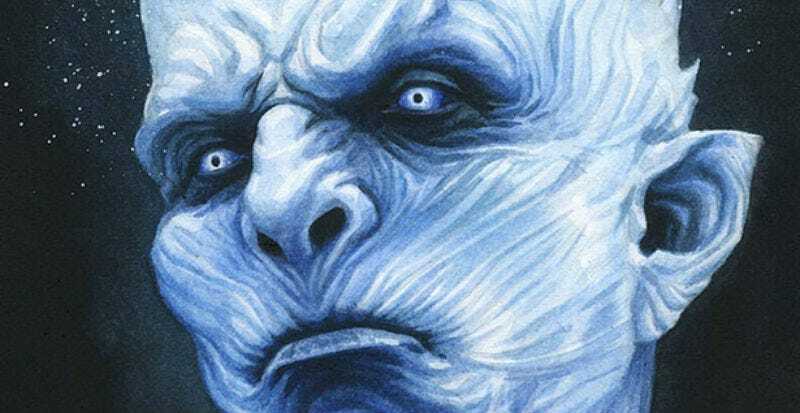 A white walker by Reuben Negron, part of Spoke Art’s Lord of the Thrones art show. In the realm of pop culture fantasy, you aren’t going to find two stronger brands than Lord of the Rings and Game of Thrones. Both based on great works of literature, one is a hugely successful film series, the other a TV show. Each has legions of fans and some of those have come together for an epic group art show. It’s called Lord of the Thrones and it opens tonight, June 2, at Spoke Art in San Francisco, CA. Not in the Bay Area? Don’t worry. We’ve got a preview—and you can see the whole show (and buy some art if you feel so inclined) at 1pm EST on Friday June 3 at this link. Here’s a sampling of work, with the artist’s name below each piece. For more information on the show, visit Spoke Art.